Lasers offer effective ways of reversing the damaging effects of sun exposure, aging, and lifestyle habits (such as smoking) on the quality, color and texture of your skin. While there are millions of cosmetic devices and lasers on the market, they generally fall into two categories: ablative or non-ablative. Ablative lasers use rapid pulses of high-intensity light to cut and burn the damaged upper layers of your skin, thereby smoothing and tightening the skin and removing wrinkles, correcting age spots, addressing and pigmentation problems. Think of ablative lasers as a full replacement of old, stained carpet and non-ablative lasers as a spot remover for lightly-trafficked carpet. Non-ablative lasers are drawn to certain colors or structures in the skin. They are non-wounding, less invasive lasers that act by stimulating collagen growth and tightening the underlying skin. The laser skin resurfacing devices used at Retief Skin Center range from a light peel with reduced downtime to deep resurfacing that results in a longer recovery time. For advanced acne scars, deep wrinkles, restoring skin texture, and overall dermal stimulation, very little recover time is required. We employ lasers for age spots, red spots, hair removal, tattoo removal, and broken blood vessels in the legs, just to name a few. The most important consideration for effective laser treatments is to have the procedure performed by an experienced laser surgeon, who is qualified to enlist the use multiple different lasers. Retief Skin Center is the premiere laser treatment center in Nashville, TN. In addition to lasers, radio frequency devices can be used to improve skin texture, tighten skin, and reduced skin laxity. These devices do not see color, so they can be used safely on dark skin tones. Consult with a Retief Skin Center provider to discuss the best lasers for your skin care goals. The Spectrum Diode laser hair removal devise is a state-of-the-art laser with the gold standard of 810nm wavelengths--which is considered the optimal hair removal wavelength to produce the greatest results with the lowest side-effect. This hair removal laser can be used on darker skin types, and is most commonly used to treat the bikini line, underarms, face, and lower legs. For more information on this laser, please visit the Spectrum website. Syneron-Candela Elos SRA IPL is a unique laser that harnesses the power of bipolar radio frequency and optical energy produced by the intense pulse light (IPL). This combined treatment allows the radio frequency energy to be preferentially sent to the already pre-heated IPL treated area, producing an increased thermal effect allowing for increased efficacy but with reduced side effects of burning, redness, downtime, and side effects. Syneron-Candela Elos Sublative laser is a radio frequency technology (RF) device that delivers bipolar energy to the skin. The effects on the skin induce new collagen formation. The downtime is minimal due to the fractionated nature of the delivery of the energy. This device is a very successful treatment for textural changes in the skin such as acne scars and stretch marks. This laser requires a series of treatments to achieve optimal results. For detailed information on this device, please visit the Syneron Candela website. Lumenis Encore CO2 Fractional laser is the gold standard, state-of-the-art treatment for wrinkles and acne scars. The Encore CO2 laser can penetrate deeper than any aesthetic laser on the market. If you have wrinkles on your face, this is the surest way to get rid of them. Unlike a traditional CO2 laser, this laser delivers fractionated pulses which translates to less downtime and less risks, including the "burned shiny face" look. Although there is significant downtime with this treatment 7 to 14 days), only one treatment is needed. Results are dramatic and can last up to 10 years or more. This laser is only appropriate for treatments on the face. For more information on this device, please visit the Lumenis website. On high power, the Erbium:Yag Laser is an ablative laser used to treat deep wrinkles, pigmentation, and acne scars. On low power, it superficially resurfaces the skin to improve pigment, clarity, and crepiness of the skin. Due to the low settings, the recovery time is much shorter, ranging from 2-4 days. Usually multiple treatments are necessary to achieve the desired results. This laser treatment is commonly used together with the IPL laser to achieve better pigment improvement per session. The Erbium:Yag laser treatment is best for those patients with the early signs of aging but no significant wrinkling. BTL Exilis Elite is monopolar radiofrequency (RF) technology that destroys fat cells and tightens the skin. This body contouring procedure isn't a replacement for liposuction or weight loss--it is used for the that little bit of stubborn extra fat that just wont go away. It is also a temporary treatment for cellulite. Four treatments will produce a year of cellulite-free legs. As with any device aimed at destroying fat cells, this device cannot separate fat cell destruction from skin tightening. Common areas treated are the neck, abdomen, love handles, lower back and waist, saddle bags, and upper thighs. InMode Facetite is a unique and very safe minimally-invasive radio frequency device that uses RFAL (radio frequency assisted lipolysis) to destroy fat cells with a wand. Inserted under the skin, it heats and destroys fat cells while tightening the skin at the same time. There is no pain with this procedure as the skin is numbed prior to the procedure. 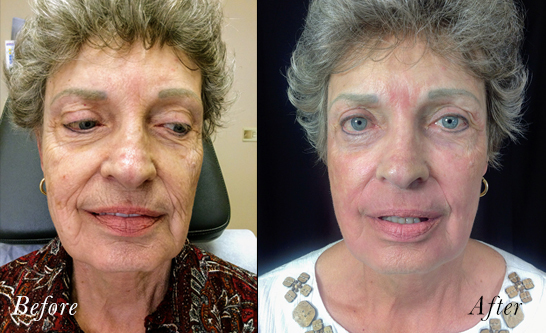 This technology can product 30 to 60% of the result a facelift can achieve in qualified clients. For detailed information on this device, please visit the InMode website. Fractora laser treatment is a microneedling system which delivers radio frequency into the dermis stimulating collagen induction. There are different lengths off needles, allowing delivery of radio frequency at different depths within the skin. Fractora laser is a great treatment for acne, acne scars, and crepiness. The Nd:Yag Long Pulse Laser offers an effective option for the treatment of larger facial vein and blood vessels on the sides of the nose (perinasal telangiectasias); it is also useful for smaller leg veins that are too small to be treated with sclerotherapy. We normally combine the Long-Pulsed Nd:YAG laser with the IPL for facial rejuvenation to ensure the most effective management of capillaries on the face.For more information on this laser, please visit the DermNetNZ website. Q-switched 532nm laser is focused on removing superficial pigment very effectively. We use this laser treatment for removal of age spots all over the body. The Q-switched 1064nm laser is used for black, blue, and gray tattoos and other pigment disorders where pigment is in the dermis of the skin. This includes treatment of post-inflammatory pigmentation, discoloration of discoid lupus, and other dyschromias. Please note that tattoo removal requires many treatments, and the skin never returns to the natural skin color after treatment. You can expect to see an improvement of 40-50%.